From November 5 to 7, Vice President Wang Qishan will travel to Singapore to attend the New Economy Forum 2018 and pay a visit upon invitation. Q: According to our information, China is scheduled to undergo its third Universal Periodic Review (UPR) at the United Nations Human Rights Council in Geneva from November 6 to 9. Could you give us more details about that? A: China will undergo its third Universal Periodic Review (UPR) at the Human Rights Council in Geneva from November 6 to 9. The Chinese government attaches high importance to this review and has submitted its National Human Rights Report to the United Nations. We will also send a high-level delegation for this UPR, which is headed by Vice Foreign Minister Le Yucheng and comprised of representatives from relevant departments of the central government, the Xinjiang and Tibet Autonomous Regions, and the governments of the Hong Kong and Macao Special Administrative Regions. The Chinese side stands ready to engage in constructive dialogues with various parties in an open and candid spirit. Q: ROK National Security Office Director Chung Eui-yong said yesterday that the ROK and the DPRK are prepared to cease all hostilities at sea, on land and in the air. ROK President Moon Jae-in also confirmed that Chairman of the Workers' Party of Korea and of the State Affairs Commission of the DPRK Kim Jong-un will soon visit the ROK. How do you comment on these latest positive developments between the DPRK and the ROK? A: This year has seen positive changes to the Korean Peninsula situation. There has been a notable increase of interactions between the DPRK and the ROK, and the relationship between the two sides has been warming up considerably. The Chinese government has all along encouraged and supported these developments. We are glad to see that in recent two weeks, interactions between the DPRK and the ROK have led to more positive outcomes which have contributed to improving their bilateral relations and advancing the denuclearization process of the Korean Peninsula and the political settlement of the Korean Peninsula issue. Q: It is said that President Xi Jinping might be visiting the DPRK soon. Can you confirm that? A: The DPRK is a friendly neighbour of China, and the two parties and two countries have always maintained friendly exchanges. If there is information about what you mentioned, we will release it in a timely manner. Q: President Trump said that his phone call with President Xi Jinping last night was very positive. Bloomberg wrote an article citing US administration officials saying that the US administration wanted to prepare possible terms for President Xi to look at on trade at the G20 summit. So, what is China's position on this and is it willing to look at those trade terms if they happen? A: I would like to reply to your questions from two aspects. On the first aspect, the Chinese side has issued the readout of the telephone conversation between President Xi Jinping and President Trump last night, and President Trump himself also tweeted about that. The Chinese side also believes that this conversation is positive, where the two heads of state had a long and full discussion and exchanged views on important issues in the China-US relations and other issues of mutual interest. They did talk about the China-US economic and trade relations and shared the following agreements. First, the two heads of state all attach great importance to the China-US economic and trade relations. President Trump said at the very beginning that the US values its economic and trade ties with China, and President Xi Jinping also stressed that the China-US economic and trade relations have been serving as the bedrock and stabilizer of China-US relations. The Chinese side always believes that such relations are mutually beneficial and win-win in nature. Second, the two heads of state agreed that the two sides need to strengthen economic and trade ties. President Trump made it clear that the US hopes to expand exports to China. He also particularly mentioned that he once talked with heads of many big companies in the US, saying that he supports US businesses in actively participating in the first China International Import Expo. President Xi Jinping also said that he is pleased to see the active participation of many US businesses in the first China International Import Expo and hopes that the China-US economic and trade relations will see sound growth. As to the issues in the China-US economic and trade relations at this point, the two heads of state both agreed that the economic teams of the two sides need to strengthen engagement and conduct consultations on issues of mutual concern. We hope to see positive outcomes to be achieved in the consultations. 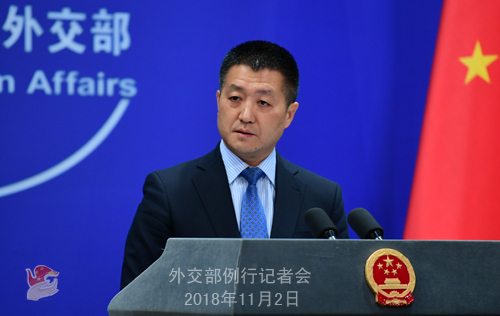 On the second aspect, as to how the China-US economic and trade issues should be negotiated, we believe the only viable way out is to conduct dialogues and consultations on the basis of mutual respect and under the principle of equality, good faith and mutual benefits, so as to address each other's concerns and reach outcomes acceptable to both sides which also meet the requirements raised by the leaders of the two sides in the telephone conversation yesterday. This serves the shared interests of both sides. 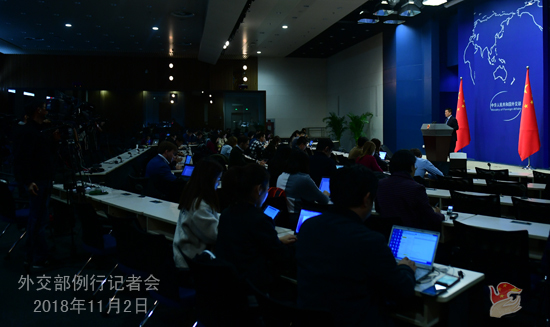 Q: US Attorney General Jeff Sessions said yesterday that China's economic espionage was increasing rapidly and that the US government was launching an initiative to crack down on such Chinese practices. Other US officials said that "they are not going to take any more from China with regard to this". They also indicted Chinese state-owned company Fujian Jinhua Integrated Circuit Corporation. What is your response to these developments in light of the telephone call last night between President Trump and President Xi Jinping? A: Regarding the specific issue in your question, we have made clear our position on many occasions. I suggest checking on the Foreign Ministry's website. If the US does have some concerns over this issue, it should present solid evidence that can stand tests by facts. As for how to view these latest remarks and actions against the backdrop of the phone call between the two leaders, I want to say that the two heads of state held an in-depth discussion and reached many agreements during their phone call yesterday. The two heads of state share one wish, which is that the two working teams could earnestly implement their agreements and seriously discuss how to resolve differences. Therefore, China sincerely hope that the working teams on the two sides could strictly implement the agreements of the two heads of state. Q: Let me put my question in a different light. The two heads of state had a call last night which they said was very positive. And then hours later, the US rolled out these indictments and said that China is committing economic espionage. My question is that do you think the US side is actually sincere in coming to a resolution on trade issues given its actions versus its words? A: I have made my points clear. President Trump expressed the wish to resolve disputes through dialogue during his phone call with President Xi Jinping. We believe that this wish serves the interests of the US and China as well as those of the international community. The two heads of state also agreed yesterday that working teams of the two sides should strictly implement these agreements. 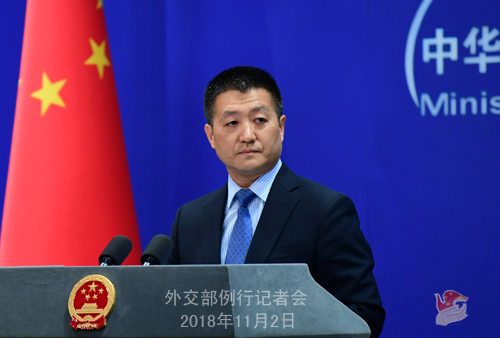 Therefore, we believe that the Chinese and American working teams should strictly abide by the instructions of the leaders, implement these agreements, and genuinely contribute to improving China-US relations and benefiting the business communities and consumers of the two sides.